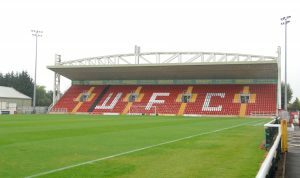 PRE-PLANNING for the redevelopment of Woking’s Laithwaite Community Stadium has been completed and will now need the approval of the Woking Borough Council to proceed, writes David Richardson. On Monday evening (5 Sept.), Cards’ fans were invited to an open meeting to discuss ways to improve the club after a turbulent past 12 months in which £450k worth of losses were made. Commercial development, improving match day experience and schemes to increase the younger fan base were all on the agenda for fans to put forward ideas. However, majority shareholder and director Peter Jordan, who has been a driving force behind the scenes for a number of years, announced that long-awaited plans for the redevelopment of the ground were edging closer. He said: “All the plans for the new stand and the development of flats round the back are completed. “They have been to the planners and they have no objections. They have overcome all obstacles and they are just going through the road survey and the archeological survey at the moment. “Everything is on course. It’s then got to go before the councillors to be approved. “In the next few months you should get some news about the development when the planning application goes in,” added Jordon. With the club struggling financially – a reduction in Woking’s playing budget this season being one example – alternate revenue streams are desperately needed and it is hoped that the redevelopment of the Westfield Avenue side of the ground will provide this. “Chris [Ingram] continues to progress the development opportunities around the ground and, despite some challenges, remains committed to seeing this through to a successful conclusion. “In addition, the club continues to seek new investment. On both of these, Chris and the club have approached, and been approached by, several people and groups. Johnson herself added: “The plans have not yet been lodged with the council formally for it to go through the planning committee or for local residents to make their comments as well. “It has gone through pre-planning as all big applications will do so. There were problems raised and they have been addressed. She continued: “Chris has always made it plain that, within the development the club itself, it will be able to raise revenue from the development of the clubhouse and the other facilities. Asked how long it will take Johnson said “it is not in our hands,” but this is at least some positive news for Cards’ fans after a difficult start to the season.